7/28 Cup of Coffee: A record-breaking home run from Bobby Dalbec (pictured) was the highlight of the night, while Pawtucket got a pair of big hits from Rusney Castillo and Adam Lind. 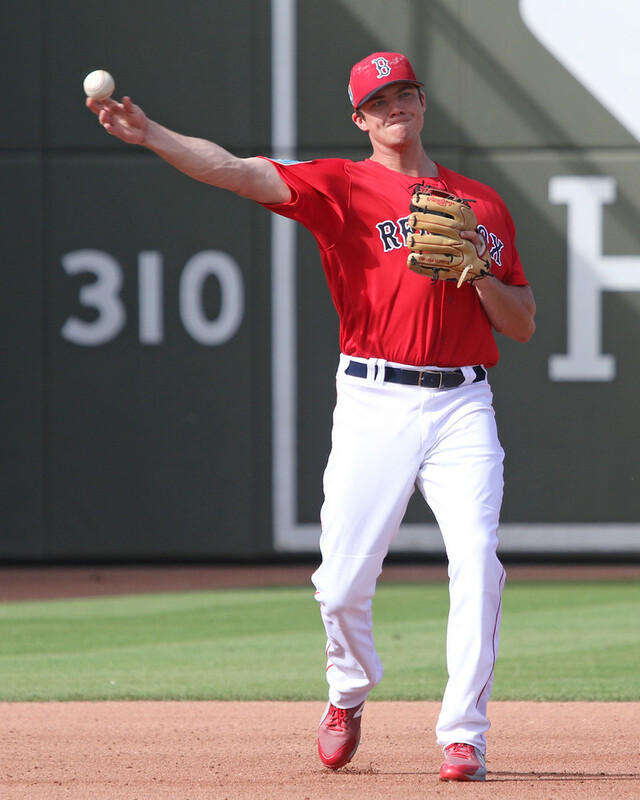 Rusney Castillo drove in three runs and Adam Lind drove in two more to lead the PawSox. After going 2 for 5 in his first game back with the PawSox on Thursday, Tzu-Wei Lin followed it up with another two-hit outing. Mike Miller and Oscar Hernandez each went 2 for 3 at the bottom of the order and Castillo and Lind each had run scoring doubles. Chandler Shepherd pitched around four walks to keep the Knights to one run over five innings and Fernando Rodriguez Jr. got his second save with 2 1/3 scoreless innings. The Sea Dogs were scoreless for the first seven innings but Chad De La Guerra laced a two-run home run in the eighth and they then scored three in the ninth after a wild pitch with the bases loaded and a two-run throwing error. Kyle Hart allowed one run over five innings, walking one and striking out six. Matthew Gorst got the win by throwing four scoreless innings. Salem fought back from an early deficit but ultimately fell short. The Dash scored four in the first off of Jake Thompson, but he eventually settled down and limited the damage to five runs over six innings, striking out eight without walking a batter. The eight strikeouts set a new career-high for the 2017 fourth-round pick. Joan Martinez followed with three innings of one-run ball, striking out four. The big hit for Salem was once again provided by Bobby Dalbec, who went 1 for 4 with a three-run home run, his 25th of the season. He now owns the single-season home run record for the Salem Red Sox. C.J. Chatham went 3 for 4 to raise his average back over .300, and Brett Netzer went 2 for 5 but also struck out three times. A solid outing from Jhonathan Diaz and a three-hit night from Tanner Nishioka helped the Drive double up the RiverDogs. Diaz struck out seven and gave up two runs, one earned, over 5 1/3 innings, and Juan Florentino struck out two over 3 2/3 shutout innings. Nishioka had three of the team's seven hits, including the only extra-base hit, and Garrett Benge was on base three times with a hit and two walks. Two errors in the second inning led to five unearned runs in a rare sloppy game for the Spinners. Chris Machamer took the loss after giving up six runs, one earned, while only recording five outs. Austin Glorius made his first rehab start for the Spinners, allowing two runs over two innings. Four Spinners had multi-hit games, including Xavier LeGrant, who went 2 for 3 with a double and an RBI, and Kole Cottam and Tyler Dearden, who each went 2 for 4 with a double. Rayniel Adames was let down by his defense, surrendering six unearned runs over 3 2/3 innings in a blowout loss to the Twins. The outing lowered his ERA to 2.70, but he surrendered eight hits as his WHIP crept over 1.00. Brandon Howlett and Juan Carlos Abreu each doubled and walked, while Lane Milligan went 1 for 3 to drop his average to .338. Miguel Suero and Jeison Pena combined on a three-hit shutout, and an RBI single from Leonel Jimenez proved to be all the offense they needed. Suero gave up one hit and struck out three over five innings, while Pena followed with four innings of two-hit ball. Jimenez also walked and stole a base, and Gilberto Jimenez went 1 for 3 with a walk and a steal. An RBI triple from Oscar Rangel tied the game in the eighth, and he scored the go-ahead run on a single from Kleiber Rodriguez. Rangel went 2 for 3 with a walk and drove in two runs, and Rodriguez went 2 for 4 to extend his hitting streak to five games. Brayan Bello continued to pitch like an ace, allowing one earned run over six innings while striking out four. He has allowed only six runs over his last 45 1/3 innings. Player of the Night: Bobby Dalbec only had one hit in four at-bats, but it was a historic home run that earned him the Player of the Night award. He set the Salem Red Sox single-season home run record with his 25th of the season, and he is now tied for second in all of minor league baseball in home runs. He is still striking out in 35 percent of his at-bats in July, but he has 10 home runs, which is more than any other Salem player has for the entire season.